The practice of Neijia kungfu is often linked to scholarship. At first, this seems a bit strange for a martial art. It is almost perverse when you consider than many of the most famous practitioners were illiterate. But the association makes sense in a lot of ways. No one has convinced me that they have a firm grasp of when and how the practice of these "soft" Chinese martial arts began and there is an aspect to the art that will probably always be a combination of anthropology and historical detective work. (I think that some form of the progenitor of this family of martial arts predates the creation of Chen style Taijiquan and probably any recognizable practice of Hsing I Chuan.) A significant point of departure for the modern practice of Tai Chi Chuan was the discovery of the text by the Wu family about the time that Yang Luchan taught them Chen style Taijiquan: it seems hard to overestimate the impact of this discovery. Beyond this, there is arguably a component of all these arts that is built on a firm understanding of the Five Elements and/or the Eight Trigrams: at least for me, this is a mathematical understanding. Scholarship plays into many other aspects of these arts and I think that these arts also tend to appeal to people with a bent toward scholarship. One highly recommended book is Andrea Falk's translation of Li Tianji's The Skill of Xingyiquan. This book is of use for anyone interested in Chinese internal martial arts. It is not the best known martial arts book. It is distributed in such a way that this is not the easiest book to find. It may be that the original book itself was written in a way that is somewhat uneven. (The reason for this is not completely clear, perhaps this book was developed partly from writings left by Li Tianji's father.) But Andrea Falk has done possibly her best translation of a great book on Chinese Internal martial arts. Skill of Xingyiquan has a perspective that is a bit different from many of the other martial art books we have seen in english. It is a book that should be in many more libraries than it is. Ma Yueh Liang and Wu Ying Hua Wu Style Taichichuan translated by Zee Wen. This is a classic book in Wu style Taichichuan. Wu Style Taichichuan Push Hands (Tui Shou) by Ma Yueh Liang translated by Zee Wen. This is another classic book in Wu style Taichichuan. It is not always easy to follow movement sequences like the Wu style push Hands practice methods from still photos. Chiflow.com is trying to use videos to supplement and help archive and preserve the forms and practice methods of great teachers. The Power Push Hands video is an effort by indoor students Gerald A. Sharp and Zhou Zang Fang to create a permanent record of the Wu style push hands practice methods. It also can be used as a companion video to Ma Yueh Liang's Push Hands book. 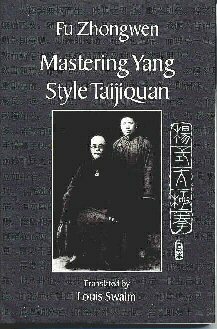 Fu Zhongwen's Mastering Yang Style Taijiquan Translated by Louis Swaim (North Atlantic Books, Berkley, CA 1999) is a very good version of a classic book. Essence and Applications of Taijiquan by Yang Cheng Fu has also been translated by Luis Swaim. These Luis Swaim translations are setting a very high standard for other people in developing English language versions of Chinese martial arts books. The Yearning K. Chen (A.K.A. Chen Kung or Chen Yen-lin) book T'ai Chi Ch'uan Tao Chien Kan San Shou Ho Lun (Dispersing-Hands Combined) has been translated by Stuart Olson as T'ai Chi Sensing Hands (Multi-Media Books, 1998) and it also is very good. It is always possible to find fault with translations but these efforts stand up very well to comparison with other translations. Tai Chi Chuan Ta Wen: Questions and Answers on T'ai Chi Ch'uan by Chen Wei-Ming, translated by Benjamin Pang Jeng Lo and Robert W. Smith is also a wonderful short book. Tai-chi Touchstones: Yang Family Secret Transmissions Compiled and translated by Douglas Wile also is highly recommended. The students of Cheng Man Ching have contributed a lot to the subject. Wolfe Lowenthal "There are No Secrets" is a good example. The Dao of Taijiquan: Way to Rejuvenation by Jou, Tsung Hwa Tai Chi Foundation, POB 828 Warwick, NY 10990. Let me say that I am not generally a fan of computer online discussion boards. They repeat horrible misinformation and disinformation. There is often weak moderation by people who are neither well informed or wise. Discussion boards are almost completely useless without excellent and wise moderation. The discussion boards tend to be dominated by the lowest common denominator and the most shrill voices. (And if they spend all their time lurking on online discussion boards, what is their opinion about practice worth?) A well known example is an ivy league college dishwasher that spent most of his time flaming people on message boards and not all of them realized that he was completely ignorant and probably insane. The martial arts boards are generally very flawed. Most people come into the martial arts discussion boards with a private agenda that is usually not advantageous to the community as a whole. ("Everyone should study with my teacher." "This idea is fashionable, so it must be right." "I posted 1063 times this week, so my opinion is worth a lot and yours is worth nothing.") It is not advisable to argue with an idiot in public. This is an attempt to describe the practice of a throwing martial art in terms of a very simple physics perspective. It takes a trigonometric approach to present the dynamics as the resolution of vector forces that is useful as a starting place. This book is interesting from the point of view of Chinese internal martial arts in that the internal aspects of Japanese Judo (such as "breaking down the opponent's stances") can be seen as an introduction to Nei Jia kung fu practice. 1. Generally in war it is the best policy to take a state intact. 2. To capture the enemy's army is better than to destroy it; to take intact a battalion, a company or a five-man squad is better than to destroy them. 3. For to win one hundred victories is not the acme of skill. To subdue an enemy without fighting is the acme of skill. 4. Thus, what it of supreme importance in war is to attack the enemy's strategy. 5. The next best is to attack his alliances. 6. The next best is to attack his army. The worst policy is to attack cities. Attack cities only when there is no alternative. This is a collection of short pieces by the Nobel Laureate that invented Polymerase Chain Reaction (PCR). It is idiosyncratic, irreverent, informative and simply interesting. There may be a reason that innovation is associated with eccentricity. The stories range from encounters with brown recluse spiders to the O.J. Simpson trial and lab work to the politics of science. The comments in this book about the blind acceptance of information found on the web should be kept in mind when you surf the internet. Six Frigates by Ian W. Toll (W. W. Norton, NY 2006). This offering is typical of this family of Aussie walkabout travel guides. It is quirky and geared more toward the back-packers than the high end crowd. I am a fan of these books. I remember selling a China guide book to an Oxford student in Mr. Turfan's Oasis Cafe in Kashgar as I left China though the border to Pakistan one year. The books are a bit strange. You can pass from reading a discussion about places to stay in a town you are visiting to various disgruntled Aussie rants on local culture. The US Navy Historian and author of The African Queen and the Hornblower Series brings a unique perspective to writing a biography of Nelson. It is quirky and a bit uneven, but if has some great insights that are unique to C. S. Forrester. (www.SimonPublications.com) ISBN 1-931541-69-8.